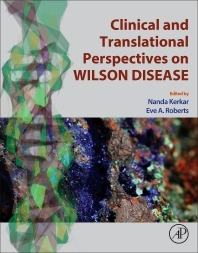 Clinical and Translational Perspectives on Wilson Disease brings together the genetics, cell and structural biology of Wilson Disease into one contemporary, easy to navigate handbook. Created to meet the diverse needs of the clinical and research communities surrounding Wilson Disease, this reference provides a worldwide approach that is concise and translational. Specifically, it provides a basis for clinicians to appreciate ‘basic science’ aspects of Wilson disease, presenting a guide for researchers to understand the clinical disorder on which their research is focused and fostering constructive dialogue and progress for this puzzling disorder. Nanda Kerkar has trained at King's College Hospital, London, United Kingdom as a hepatologist/liver transplant physician and did her research in the laboratory on autoimmune liver disease at the Institute of Hepatology, University College London. She has been practicing in the United States since 2002 and was the Medical director of the Pediatric Liver Transplant Programs at Mount Sinai School of Medicine, New York and then Children's Hospital of Los Angeles, before moving to Rochester in 2017 to build a liver Transplant Program for children in Rochester. She is Professor of Pediatrics at University of Rochester Medical Center and Director of Pediatric Hepatology and Liver Transplantation at Golisano Childrens Hospital, Rochester. She is also Adjunct Professor of Pediatrics at University of Southern California on Los Angeles. She has been involved in highly productive clinical research in children’s liver disease and has been named to the American Pediatric Society in 2014. She has lectured nationally and internationally and has over 100 peer reviewed publications. Eve Roberts trained with Professor Dame Sheila Sherlock at the Royal Free Hospital in London, United Kingdom, and became a pediatric hepatologist and researcher at the Hospital for Sick Children in Toronto. She was the clinician on the team which identified the gene abnormal in Wilson disease and she later collaborated to develop metalloproteomics as a research strategy for Wilson disease. She has written extensively on Wilson disease and pediatric hepatology. Previously full professor and senior scientist, she is currently an adjunct professor of Paediatrics, Medicine and Pharmacology & Toxicology at the University of Toronto, and an adjunct scientist in the Genetics and Genomic Medicine program of the Hospital for Sick Children Research Institute. Additionally, she is an Associate Fellow in the History of Science and Technology Programme at the University of King’s College in Halifax, Nova Scotia.